With the new regulations of the United States of America for the Visa Waiver Program and the European regulation (EG) No. 2252/2004 of the council from December 13, 2004 new passports of several countries will carry not only printed features but also electronical chips will be added with personal data of the holder. The new biometrical information stored in the chip (face, finger and/or iris) establishes a link between the document and the holder. Travellers moving across borders will in future not only visibly inspected by an officer but they will also use a fingerprint scanner and a camera for face recognition. Our effort contains the integration of the new technologies into already existing processes and infrastructures without producing more effort for an officer during his daily work. The result is a better and more secure control without a time effort for travellers at the border. 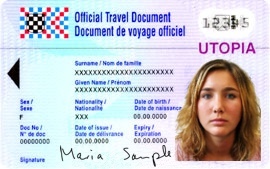 Solutions of ID Travel contain these efforts and more in their products for border control. The three main products, which cover the whole process from manufacturing the document to the use during travelling, work independently from each other in several infrastructures.